Sadly, this product has now sold out. Why not try one of our other Christmas dinner boxes instead? Still need to sort your Christmas food? We’ll deliver your whole organic feast in one box, in time for the big day. The star of the show is a 1kg turkey breast joint, bursting with pork and apricot stuffing and wrapped in bacon. Alongside, a small festive veg box, 10 pigs in blankets, and cranberry sauce. For dessert, there’s 6 mince pies, a small Christmas pudding, and zesty clementines. And to finish, sea salt and cracked black pepper biscuits, and creamy brie. 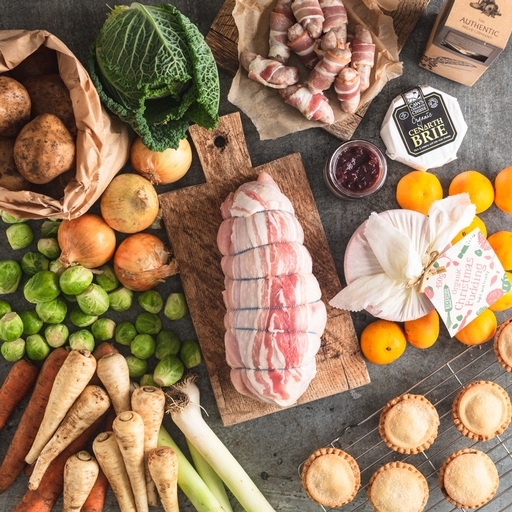 You can order more Christmas food in our online shop. Veg storage: Delivered fresh from the farm, so wash before eating. Store in a cool place. Minimum shelf life – 1 week. Meat storage: Keep in the fridge below 5°C and use by the date on the label. Turkey can be frozen on the day of delivery, but pigs in blankets have been previously frozen so do not re-freeze. Minimum use by date 26th December. Veg is grown by us, or by small-scale family farms we know, trust and look after. Our turkeys are traditional Bronze birds, slow-reared on small West Country farms for maximum flavour and tenderness. Stuffing and pigs in blankets are made with pork from Helen Browning’s organic farm in Wiltshire. The mince pies, Christmas pudding and cranberry sauce are handmade to our own recipes. Brie is from Caws Cenarth in Wales, and savoury biscuits are the Authentic Bread Company’s finest. Stuffed turkey breast: Turkey breast (85%), pork and apricot stuffing (Pork (41%) (pork sholder, pork fat), water*, rusk (wheatflour, calcium carbonate*, iron*, nicotinamide*, thiamin*), smoked bacon (pork, salt*, cane sugar, preserative (sodium nitrite*, potassium*)), chestnut, apricot (apricots, rice flour), onion (onion, sunflower oil), salt*, lemon zest, sage, white pepper, nutmeg), bacon (pork, salt*, cane sugar, sodium nitrite*, potassium nitrate*). Pigs in blankets: Chipolata sausages (pork (89%), water*, seasoning (breadcrumbs (wheat flour, yeast*, salt*), potato starch, sea salt*, ascorbic acid E300*, white pepper, ginger, sage, sugar, nutmeg, black pepper, thyme, rosemary extract), natural sheep s casings), streaky bacon (pork belly, sea salt*, sugar, sodium nitrite*). Cranberry sauce: Cranberries (80%), raw cane sugar, lemon juice, water*. Mince pies: Wheat Flour (Wheat, Calcium Carbonate*, Iron*, Niacin*, Thiamin*), Apples (9%), Currants (9%), Sultanas (9%), Salted Butter (8%) (Butter (Milk), Salt*), Coconut Oil, Cane Sugar, Brown Sugar, Sunflower Oil, Candied Peel (2.7%) (Orange Peel, Lemon Peel, Glucose Syrup, Salt*), Raisins (2.1%), Orange Juice, Cognac (1.5%), Cider, Mixed Spice, Flaked Almonds, Cinnamon, Nutmeg, Ground Ginger. Christmas pudding: Sultanas, brown sugar, carrot, apple, self-raising wheat flour, breadcrumbs (wheat flour, salt*, yeast*), raisins, currants, butter (milk), sunflower oil, mixed peel (orange peel, corn glucose-fructose syrup, cane sugar, lemon peel, lemon juice), marmalade (raw cane sugar, oranges, lemon juice, fruit pectin), eggs, golden syrup, brandy, lemon juice, milk, nutmeg, cinnamon, mixed spice (coriander, cinnamon, ginger, nutmeg, caraway, cloves), grated lemon zest. Sea salt & cracked black pepper biscuits: White wheat flour (wheat, calcium carbonate*, iron*, niacin*, thiamin*), salted butter (milk, salt*), salt* (2%), pepper (1%), cream of tartar*, bicarbonate of soda*. Caws Cenarth brie: Pasteurised cows' milk, salt*, vegetarian rennet, starter cultures.